Local facilities. Shaw Ghyll caravan and camping Upper Wensleydale. There's plenty to see and do from Shaw Ghyll. 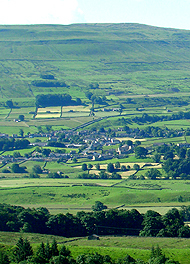 The town of Hawes offers a good selection of shops, cafe's, pubs and restaurants, the Wensleydale Creamery, Rope makers and Countryside museums as well as Gayle Mill. Watch sheep dog trials, every Thursday at 6.30pm Summer, fish for trout or simply walk in peace and quiet across the beautiful Yorkshire hills and dales. Shunner Fell is on our door step. Take a drive along the famous Butter Tubs Pass into magnificent Swaledale. Great family days out include the Lightwater Valley Theme Park and the historic City of York. Dales countryside attractions include Hardraw Force (the highest single drop waterfall in England), Redmire and Ayesgarth Falls. There are many web sites offering guidance to activities and attractions in The Dales. Do you want to accept our Cookies ?